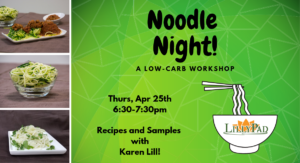 Join us for this low-carb noodle night! Karen will surprise you with her varieties of delicious, low-carb, homemade noodles. Whether they're in sauces, soups, or stir-fries, these easy to make noodles will give your recipes added flavour and nutrition.